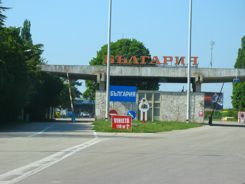 "Worldwide road trips open up charming villages and interesting back roads. We think we see much more this way. Road trips are about as American a vacation as.... well as apple pie and baseball. But the USA isn't the only place that road trips are fun. ...and our foreign friends like making road trips in the USA! Sounds just like what we say for international travel in general, doesn't it? At least give it some thought when you're planning your next trip. We love renting a car and just rambling around new countries. But taking a road trip will give you freedom to go to small towns.... see the countryside. Sure there are countries and cities where you probably just wouldn't want to drive. Most cities fall into that don't bother with the car category... unless you're on business and need a car or if you're just driving in and parking. We have driven into and out of Florence, for instance when we've been on a a road trip through Italy. 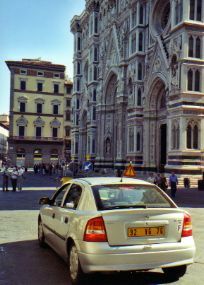 We even got to drive right past the front of the Duomo early one morning because our hotel was right across the corner from it. That was a rare treat! And we've driven into and out of Rome on different trips. We've driven out of Paris and Madrid too... but we've usually returned the car to the airport. As a general rule, you're better off without a car in cities. Worldwide road trips are best when you're getting out into the countryside. 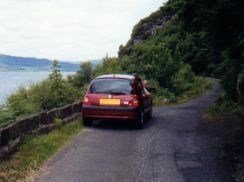 A car lets you drive the back roads... see the little villages and towns. There are great drives all over Europe, Canada and the U.S., but don't limit yourself to those choices. 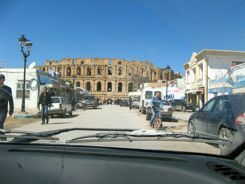 El Jem, Tunisia years ago. Fun, but always check country advisories. We've had great drives in South America and Mexico, exploring ruins and finding wildlife. We have friends that explored all of Costa Rica by car, and enjoyed doing their own touring. Australia and New Zealand are naturals for worldwide road trips... just remember you have to drive on the "wrong side". We've also driven in South Africa. One time we picked up our car at the Botswana border and drove through Kruger National Park and on to Johannesburg. We drove around Cape Town and South African wine country too. We've driven in Turkey and easily found accommodations along the way. We hired a friend-of-a-friend to drive us in Jordan, but we talked to people who were driving themselves, and they had no problems. To get ideas for world wide road trips, just think outside of the cities. Use your hobbies or interests to plan your trip. What are some of the things we've done? We like looking for archeological sites. We've done some airplane and steam train spotting. How about visiting gardens or castles? There are spectacular national parks to explore everywhere. We've been birdwatching and wine tasting just exploring spectacular scenic areas like the south of France or the Cinque Terre in Italy or the painted churches in Romania. Read about some of our worldwide road trips to get ideas for road trips. We haven't found time to write about all of them, but we think we have enough stories to set you to thinking and dreaming about a foreign road trip of your own. Some day we'll find time to post photos on all of these pages too! Can You Cross Borders? You do have to check and make sure you can take rental cars from one country to another. This is up to your rental car company, so be sure you ask them when you're making your reservation. If one rental car company won't allow it, check with another. It may vary from company to company. You also want to check advisories and make sure it's safe. Renting a car in Papua New Guinea, we had to chat with the local police to get safety instructions and make sure the road was passable. Dirt Roads or Big Critters? 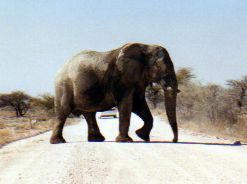 If you're going on an African safari type road trip, you'll probably have to get "animal collision insurance." Your credit card may provide insurance that will cover you adequately if you're driving on "normal" roads, but not if you're heading into the back country. You're apt to run into dirt roads in Africa for sure, but you may also run into dirt roads if you go to national parks or even wine tasting in the United States, South America, Australia... almost anywhere. Check with your credit card company to see if they will cover you or if you need to buy additional insurance from the rental car company. Real Off-Road Stuff? Are you going somewhere rugged enough that you need a 4-wheel drive? That will cost you more for sure, but it could be worth it. Share the expense with another couple if you can. You may find that prices are cheaper for food and lodging out in the countryside, and that could offset the expense of the rental car and make that worldwide road trip seem reasonable. We think it's such a great way to travel that you should definitely consider it as one of your options.